Back when I was a teenager devouring science fiction novels, I read a wonderful short story written in 1941 by Theodore Sturgeon, called “microcosmic gods.” Sturgeon’s god was Mr Kidder, an amateur scientist who had the great idea that – instead of trying to invent new products on his own – he could create his own fast-living species and they could invent for him, solving any problem that Mr Kidder could pose, if not within one generation, then in no more than two or three. Mr Kidder’s microcosmic civilisation invented, among other things, super-strong aluminium, a generator powered by cosmic energy, and an impenetrable force field. The thing about science fiction is that it guesses right in unanticipated ways, and so, while we still don’t have any of those inventions, we do now have experimental evolution. Labs around the world regularly use microbes, which evolve quickly, to solve problems in evolutionary biology. One such example is given by Manhes and Velicer (2011), who show that a social bacterium, Myxococcus xanthus, can evolve to police cheaters within its own species. Myxococcus is considered social because it builds a multicellular fruiting stalk when local food runs out. From the top of this stalk, spores that float away to colonise new territories are released. The problem is that the cells in the stalk die; only spores get to survive another day. Which cells get to be spores? 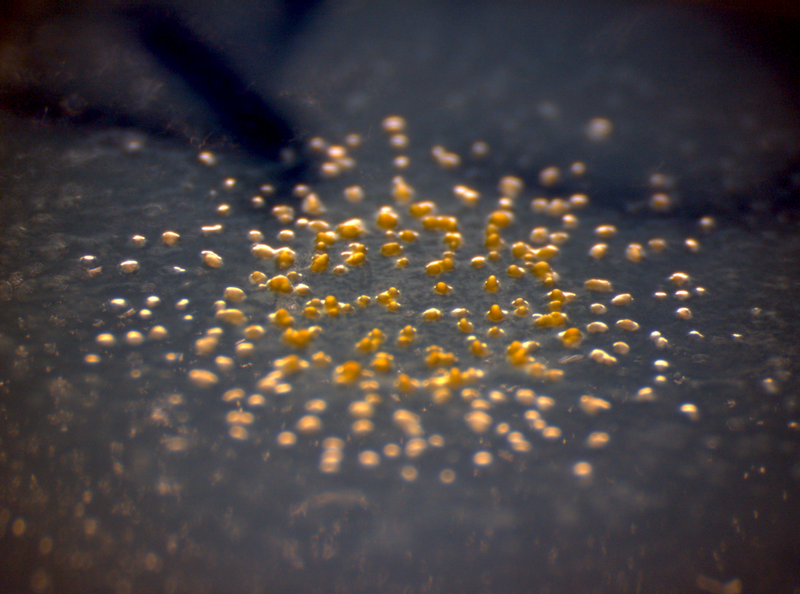 It is probable that some process that is random, but fair, determines cell fate (which is a better deal than certain starvation), but it is known that cheater mutants arise and insert themselves into the limited population of spores. How are such cheaters kept from taking over completely, leaving no Myxococcus to build stalks? Manhes and Velicer let Myxococcus solve the problem for itself. They grew up sequential generations of normal bacteria in starvation conditions, which naturally resulted in stalk formation. In each generation, however, the normal bacteria were challenged by mixing in a cheater strain, and the idea was that the normal strain would evolve counter-mutations against the cheater. This is exactly what happened. In mixtures, there were three to five times as many spores of the ‘evolved’ strain as there were cheater spores, but the ancestral normal strain was almost eliminated by the cheater strain in control tests. Importantly, when all three strains (evolved, ancestral and cheater) were mixed, the first two both did better than the cheater – meaning that whatever counter-mutations had arisen, they appear to be specific to suppressing cheaters, as opposed to some general trait that kills off non-self-strains. This specificity of action against cheaters is the hallmark of policing, rather than indiscriminate war. Aside from the sheer coolness of the experiment, there is an important implication for medicine. One of the ways that human pathogens increase their virulence is by cooperating to defeat the host’s immune system. It has been suggested that one could engineer mutant cheaters to disrupt such cooperation, allowing the patient’s immune system more time to mount a defence. Manhes’ and Velicer’s results suggest that pathogens could evolve to counter such a therapy. No word yet on cosmic power generators. « A bacterial method for the biocontrol of dengue fever.